As the search for the French and Indian War period Fort Hunter continues new discoveries are made daily. As is so often the case with archaeology, these new finds pose more questions than they answer. While no structural evidence that can be definitively identified as belonging to the fort has been found, fort period artifacts are being recovered, such as fragments of tin-glazed earthenware, Whieldon ware and plain salt-glazed stoneware. 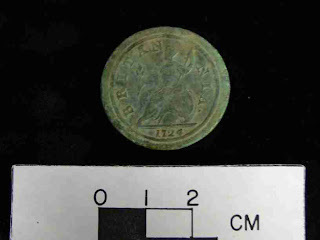 By far the most exciting find to date this season is that of a George I halfpenny dated 1724, recovered from what is being interpreted as the builder’s trench of the west wall of the ice house in the back yard of the mansion. Historic documents reference an ice house being built in 1794, however, the dimensions cited do not agree with the current structure. The halfpenny and mid-eighteenth century ceramics suggest this structure may be earlier than previously thought. Additionally, it appears that the builder’s trench for the well feature intrudes into the ice house’s builder’s trench, indicating a later date of construction. The possibility of the well feature relating to the fort still exists, depending of course on the construction date of the ice house which is currently in question. Further complicating the interpretation of the site, prehistoric finds continue to be made in the main excavation block. Feature 29 in particular, with the exception of two cut nail fragments has produced exclusively prehistoric material such as scores of chert, jasper and rhyolite debitage, as well as a dozen small fragments of quartz tempered, cordmarked ceramic sherds. The excavation will continue for the next two weeks as part of the celebration of October as Archaeology Month in Pennsylvania. Sunday October 4th marks Indian Festival Day at Fort Hunter Park, and among the many activities and exhibits, archaeologists will be on hand to answer questions about the ongoing excavation. The dig site is open to the public, Monday through Friday 9 AM to 4 PM, and volunteer sheets are available for those wishing to assist us in our search for the fort at Fort Hunter Park. 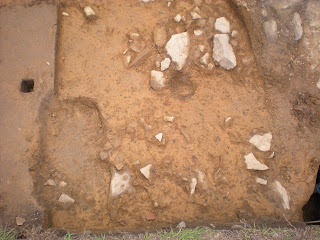 Shortly after removing the backfill encapsulating the 2008 excavation block the discoveries continued. One objective of reopening last year’s dig is to establish the relationship between the circa 1790 ice house and the adjacent structural feature interpreted as a well. While clean troweling the current floor of the surrounding excavation units a handful of stone chipping debris and two quartz tempered cord-marked prehistoric ceramic sherds were recovered indicating that this particular location along the banks of the Susquehanna River was a favored spot long before any French and Indian War fortifications were erected. Additionally, a series of five by five foot units have been dug to connect with areas excavated in 2006 and 2007. Fort period artifacts recovered from the upper stratum of these units include a large gun flint of English flint and a piece of scratch blue salt-glazed stoneware. Other diagnostic artifacts reflect a mix of the late 18th and 19th Century such as hand painted and transfer-printed pearlware, creamware, and porcelain. This Sunday marks the annual Fort Hunter Day at the mansion and surrounding park. Archaeologists will be on hand to answer questions from the public and volunteer sign-up sheets will be available for those wishing to assist us in finding the fort at Fort Hunter Park. 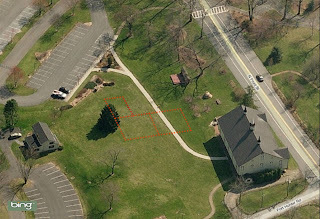 During Archaeology Month 2009, archaeologists from the Pennsylvania Historical and Museum Commission (PHMC) will investigate one of "history's mysteries” - where is the "fort" at Fort Hunter? Beginning on September 14, PHMC archaeologists will conduct an archaeological testing program at Fort Hunter Mansion and Park, located five miles north of the city. The goal is to locate the remains of the French and Indian War era supply fort occupied between 1757 and 1763. 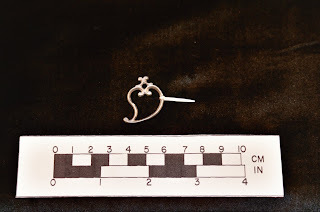 This will mark the fourth season of this project and numerous fort period artifacts and features have been recovered - some of these may be part of the fort occupation. 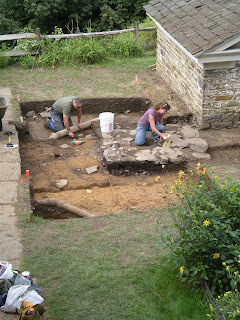 The stockade and the blockhouse, however, have yet to be located as our excavations continue. The goals for this year’s investigation. This year there are two main objectives. We will continue to search for the fort’s stockade line by excavating a series of trenches mainly in the yard around the mansion. Of considerable interest, is a new discovery that Jim Herbstritt made while examining aerial photographs of the property. He noticed several patches of grass across Front Street and east of the barn that appeared to be different in color and contrast than that of the surrounding vegetation. The anomaly seems to outline an L-shaped area about 100 feet by 100 feet long reminiscent of a buried foundation wall or some other architecturally related feature. There are no known records of buildings on this part of the Fort Hunter Park property therefore we are speculating that it possibly marks the location of the former “old barracks”. Several trenches will be placed across this feature to determine its identity, function and age. The second area of interest this season will be the north side yard of the mansion where a waterwell was discovered last year. It is stone lined and located adjacent to the 1805 ice house. Again, there are no historic maps of the well’s existence and its placement suggests that it is older than the ice house and therefore dates earlier than 1805. The top of the well contains 19th century artifacts but the bottom could contain very important artifacts from the fort period occupation. Excavating a waterwell is a complicated undertaking that may require several seasons to complete. This year we hope is to resolve the chronological relationship between the well and the ice house. We will also excavate the soils surrounding the well down to a depth of three feet which will provide a better idea as to the nature of the well’s construction. The 2008 excavations revealed that the upper 12 inches of the site’s stratigraphy contain prehistoric materials as old as 9,000 years and these need to be archaeologically recovered prior to the well’s excavation. 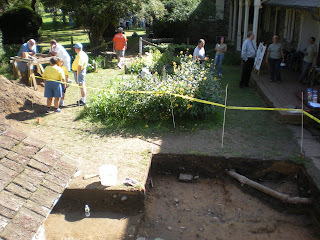 Our project is part of Pennsylvania’s “Archaeology Month” celebration in September and October. The excavations are open to the public, weekdays from 9:00 am until 4:00 pm, weather permitting. 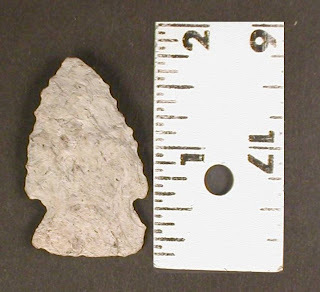 For more information on Fort Hunter or the archaeology of the Susquehanna Valley, visit PAarchaeology.state.pa.us or the Hall of Anthropology and Archaeology at The State Museum of Pennsylvania . The State Museum's Section of Archaeology will be returning to the Native American Powwow held on City Island as part of the Kipona Festival in Harrisburg this Labor Day Weekend, Sept. 5, 6 and 7. 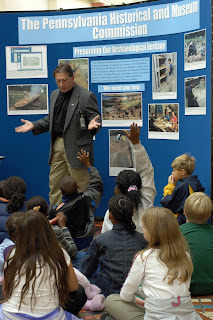 Attractions of the State Museum’s display are to include the ever popular recreated dugout canoe, informational brochures on State Museum programs with coupons for reduced admission, children's activity worksheets, the 2009 Archaeology Month poster, and an exhibit of select artifacts from City Island excavations. The purpose of our presence at the powwow is to raise awareness of all things archaeological; that sites are important non-renewable resources, the upcoming public archaeology program at Fort Hunter Park, October is Archaeology Month in Pennsylvania, Archaeology Day at the State Capitol, and to encourage visitation to the State Museum and our websites. Come out and enjoy the unofficial end of summer this weekend at the powwow on City Island. For more information, www.PAarchaeology.state.pa.us or the Hall of Anthropology and Archaeology at The State Museum of Pennsylvania . This week's guest blog comes from Ryan Updike, summer intern for PennDoT's Bureau for Environmental Quality and Design. Ryan is a graduate student at Virginia Tech and will complete both an MA in History and an MA in Education next spring. He’s a native of York County. One important point hit me during my time spent auditing the Frankstown Branch Bridge replacement over the Juniata River in Blair County: wow, historians should really collaborate with archaeologists more often! The results of such a strategic partnership could yield so much more in the way of research and scholarship on resources and features both above and below ground as well as strengthen the bonds between two different camps in Cultural Resource Management. 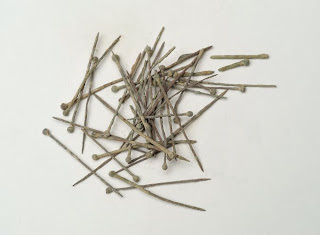 Even the smallest archaeological find can yield rewarding information for a historian. The Phase I and Phase II Archaeological Surveys on this bridge project south of Hollidaysburg on Rt. 36 only dug up 107 artifacts that ranged from historic pottery to prehistoric chert flakes to chert tools. Just like historians, archaeologists rely on the evidence they find, and they then interpret whatever evidence that is found. At the Frankstown Branch site the artifacts showcased a small prehistoric task group or nuclear family group that subsisted by practicing a hunter/gatherer system. The site also contained entirely local resources and features, which bent the analysis toward the site being used by a small band from a local community. The analysis on the social aspects of the site constituted important as well as usable information to any social historian investigating native cultures. This is the interesting point. This very small fraction of archaeological information can shed light on social habits that historians might set their sights on when investigating local prehistoric communities and their social makeup. The trouble with historians and archaeologists is they forget what they have in common. When it comes to interpreting the past, historians and archaeologists are slaves to what they find. We are governed by it. If together we work to combine the soiled and written evidence, perhaps we can arrive at a clearer concept of the past. This new vantage point can then serve as a springboard for better management of our resources regardless of location in reference to the ground. Lastly, this historian must thank the Section of Archaeology at the Pennsylvania State Museum for the opportunity to work with them. Thanks, Janet, Andrea, Liz, Dave and Dr. Carr. 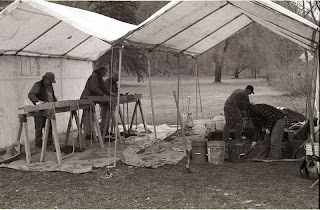 A cremation cache (Feature 2) was discovered in 2003 by Pennsylvania Historical and Museum Commission archaeologists during subsurface testing at site 36UN10, for the proposed Union County Business Park located north of Allenwood, Pennsylvania. The contents of this cache included eight ovate-shaped bifaces of gray colored tabular chalcedony, a hellgrammite point/knife of gray banded rhyolite, a two-hole gorget of gray siltstone and a faceted sphere of graphite. Fragments from two of the eight chalcedony bifaces were cross-mended and along with the others show evidence of heat fracturing from the cremation process. The thick mass of charcoal encapsulating the cache had traces of co-mingled calcine bone, ash and burnt soil which we believe to be the remains of non-organic cremated residue. Some of the cultural objects were inadvertently displaced by the backhoe operator, therefore, we are unsure of their original positions within the cremation pit. Careful investigation by PHMC archaeologists, however, concluded that the cache must have rested on the pit floor since in situ remnants of the cremated mass was found there. 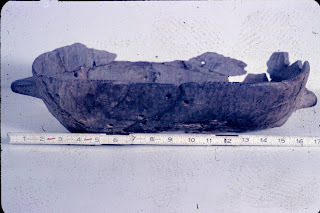 A short distance southeast from the cremation pit, another pit (Feature 3) was excavated that contained charred fragments of sheeted bark, possibly the remnants of material used as pit lining. The contents of Feature 3 include a small Lamoka-like point, burned sandstone fragments, sandstone cobble hammerstone and chert, jasper, silicified siltstone and rhyolite debitage. A third but smaller pit (Feature 4) having no bark lining but a similar artifact assemblage was also found. The overall diversity of diagnostic artifacts recovered from the site suggests that 36UN10 was occupied by Native Americans from the Late Archaic through the Middle Woodland Periods (Range of Appropriate Dates here). However, the tightly compressed site stratigraphy displays little separation in the soil between different cultural groups as the land was reused again and again over a span of 2500 years. 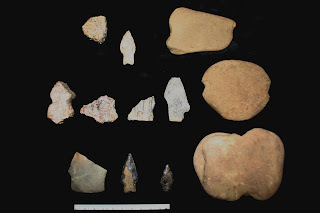 Lamoka points/knives; Susquehanna Broad points/knives; Fishtail points/knives; steatite bowl fragments and Marcey Creek steatite tempered pottery make up the diagnostic artifact assemblages from these strata. The 1992 Phase III archaeological data recovery project of Louis Berger & Associates on the river terrace south of Allenwood (36UN82) documented a similar stratigraphic sequence of human occupation for the West Branch Valley (Wall 2000). There, archaeological investigations revealed a clearer picture in comparison to the mixed Archaic through Woodland sequence at 36UN10. 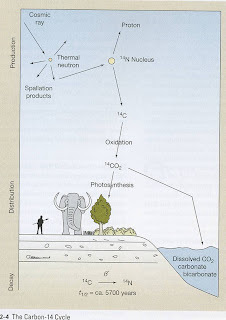 Carbon-14 analysis of the carbonized material found in the intrusive, yet isolated Woodland pits, Features 2, 3 and 4 described above, was employed to demonstrate a distinct chronological separation of the cremation activity found on 36UN10 from the earlier Archaic components also present on the site. A sample of charcoal directly associated with the cache submitted to the University of Arizona Radiocarbon laboratory returned a date of 1680+/- 40 radiocarbon years B.P., (before present). Utilizing two sigma ranges the corrected dates are 246 AD: 434 AD. Partially preserved charred remains of bark lining in pit (Feature 3) was discovered nearby and likely belongs with the Woodland cremation component at 36UN10. A sample of bark from this pit, also dated by the University of Arizona, yielded a corrected date range of 128 AD: 384 AD. The overlapping of the two dates would indicate that the features are contemporary and date to the Middle Woodland Period, thus demonstrating that burial ceremonialism continued after the Early Woodland Period ended in the Susquehanna Valley. 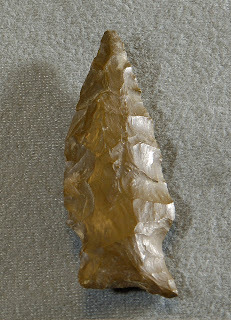 The presence of a Hellgrammite point/knife with the 36UN10 cremation would imply that the long held notion of Hellgrammite point/knife types being a regional manifestation of the Early Woodland needs to be rigorously tested with more investigations at other comparable sites in the valley. In contrast to the cremation feature found at 36Un10, other mortuary sites of the Susquehanna Valley are radiocarbon dated to the earlier part of the Woodland period (1,000-500 BC.). 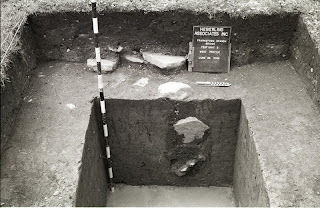 Artifact assemblages from such sites tend to include Meadowood blades, stone tube pipes, gorgets, copper ornaments and rarely, bird and boatstones (Kent 1994). 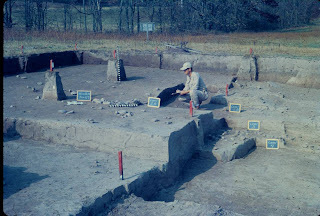 1994 Discovering Pennsylvania’s Archaeological Heritage. The Pennsylvania Historical and Museum Commission. 2000 A Buried Lamoka Occupation in Stratified Contexts West Branch Valley of the Susquehanna River, Pennsylvania. 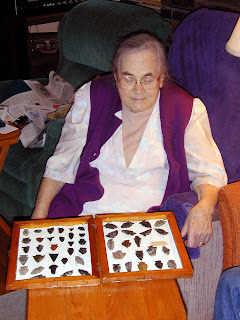 Pennsylvania Archaeologist 70(1):1-44. My name is Thomas Wambach and I am an Anthropology/Archaeology major at Indiana University of Pennsylvania (IUP), about to enter my junior year. This summer, I participated in an internship with the Pennsylvania Historical and Museum Commission (PHMC), Archaeology Section located in Harrisburg, Pennsylvania. I received this internship via the Diversity Internship Program, whose goal is to increase staff cultural diversity in Pennsylvania’s museums and cultural organizations. As I am of Haitian American ancestry, I found the program to be captivating as well as a worthwhile experience. It certainly has increased my knowledge of archaeology outside the classroom by helping me learn in a professional environment, under a well qualified mentor in my field. 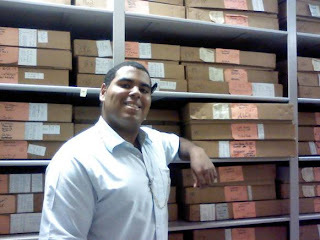 As an intern in the Archaeology Section, I accomplished a number of personal and professional goals, and worked on a variety of different tasks and projects. My main project of focus during the internship was the processing of a collection of artifacts from an archaeological site in Clinton County, Pennsylvania known as the West Water Street Site (36 CN 175), located in Lock Haven, and excavated in 1992 by students from the University of Delaware. This was a stratified prehistoric site spanning nearly the entire time span of human occupation of the Susquehanna Valley. 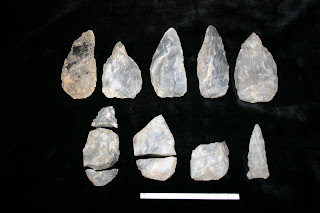 The artifacts I worked with dated to the Pre-Middle Archaic, Middle Archaic, and Late Woodland periods of human occupation in Pennsylvania. 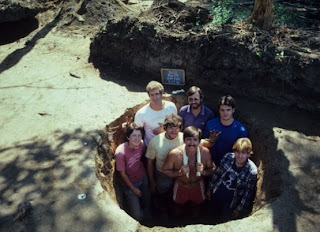 The first project task involved using printed records of the site’s artifacts, provided by the University of Delaware, to reenter data on artifacts spanning the first section of archaeological excavation at the West Water Street Site into an electronic database. An electronic database was unavailable from the University of Delaware for various reasons. Once this section of the database was reentered and using a printed spreadsheet of the artifacts’ locations, I began to pull artifacts, by catalog number, from their original “pizza box” shaped cardboard boxes in one of the collection holding rooms occupied by the Section of Archaeology so that I could re-house these artifacts. 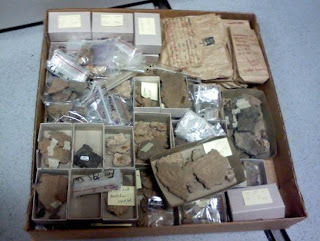 That is to say, I pulled artifacts with catalog numbers 1200, 1400, 1500 etc, and re-housed them with their correct provenience information in larger acid free cardboard boxes. This encompassed a majority of the work I accomplished with the West Water Street Project, and represented a continuation of work performed by previous interns in the Section of Archaeology. The project was initially difficult, because many of the artifacts were scattered among a multitude of boxes in no particular order. Hence, finding the correct artifact was not only tedious, but also presented the possibility that certain artifacts might be missing from their original box. Overall, I estimate that more than four hundred bone, stone, ceramic, and FCR (fire cracked rock) artifacts were pulled and re-housed during my time here. My time with the Section of Archaeology, however, was not simply limited to this activity. I also attended intern seminars held every Friday by Penn DOT’s Bureau of Design, Cultural Resources Section’s own Mr. Joe Baker. 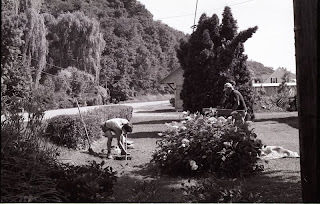 These seminars were organized and designed in a manner similar to a class lecture and discussion course to teach interns valuable lessons on historical preservation in Pennsylvania and the rest of the country, especially by introducing the rules and regulation of Section 106 of the National Historic Preservation Act. 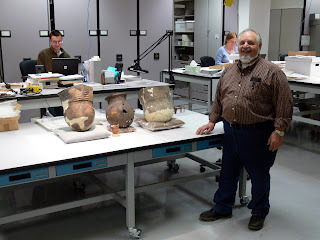 Other additional duties included the re-housing of artifacts outside my specific major project activity, and checking climate controls (temperature and humidity) in all artifact collection rooms. During the latter activity, I discovered that dehumidifiers are fickle little machines! I also briefly participated in field work at an archaeological site near Millersville, which was a good way for me to review the excavation and field training skills I’d learned during the summer of 2008 during IUP’s field school course. Moreover, from time to time, I assisted staff in maintaining the museum exhibits and galleries in the State Museum and Archives areas. 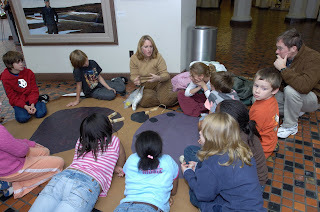 This activity allowed me to visit the museum, that I had frequented as a child. I also attended an archaeology conference that took place in Harrisburg and I learned, first hand, how the museum receives new artifacts from public and private institutions, as well as donors from across the Commonwealth. My summer internship also provided me the opportunity to show off my skills as an artist by drawing a reconstructed stone core artifact for one of my colleagues. I certainly hope the sketch proves useful in the future. I also took part in field trips to other museums in the state and to sites under protection by the National Register of Historic Places to evaluate their techniques of reaching the public as well as in artifact and site preservation, all the while comparing my observations with those services provided by the State Museum. In addition, I took part in a small public outreach activity by answering a letter sent by someone who had special interest in local archaeology. I provided the client with resourceful online and book sources so that his research could be completed. Despite the fact that the client was writing from prison, the effort demonstrates that archaeology is for everyone, and that we [archaeologists] are humble public servants. Most importantly, I established contacts and friendships with the staff here in the PHMC, which I hope will help me in the future. My time here was very educational, fun, and an otherwise memorable experience that I will value greatly. I recommend contacting, interning, or communicating with the PHMC to anyone who is studying archaeology, like me, or to those who are interested in archaeology and/or prehistoric and historical preservation. It certainly proved to be an integral and priceless education and experience for me! Thank you to all my friends and staff from the PHMC! The Pennsylvania Historical and Museum Commission (PHMC) has carved three dugout canoes over the past decade. These have been done as public programs using replicated historic and/or prehistoric tools. The sight of people sometimes dressed in loin cloths, wood chips flying and fire attracts a lot of attention and these programs have been very popular with the public. The resulting dugouts have been included in a variety of presentations, most notably, the annual Pennsylvania Farm Show. Although the publicity is good, these projects are examples of experimental archaeology. They are being conducted to aid in the interpretation of the archaeological record. As a simple definition, a dugout canoe or, simply, a “dugout” is a hollowed-out log used as a watercraft. It is typically made in a cycle of burning and cutting that includes repeatedly burning the log with a controlled fire and then scraping and chopping out the charred and softened wood with a variety of tools that can be as diverse as shells, wooden scraping tools and stone adzes. The dugout is likely the earliest form of constructed watercraft in the world, and specimens in Europe have been dated to over 9,000 years old. Considering that humans voyaged to Australia at least 50,000 years ago, dugouts are probably at least that old. In North and South America, dugouts have been the main form of water travel since Native Americans arrived from Siberia over 16,000 years ago. In addition, there has been recent speculation that these early people first arrived by boat. The Northwest Coast seems to have the greatest variety of dugouts with some of these being very large and elaborately designed. In Eastern North American, dugouts are preserved in the lakes and bogs of Florida, Louisiana, North Carolina, Tennessee, Ohio and Pennsylvania. The oldest of these date to over 6,000 years before the present. During our 2005 project, we only used tools that were available to the prehistoric inhabitants of the Commonwealth. 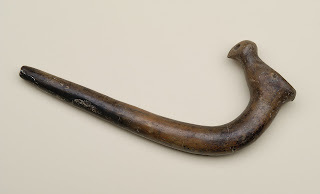 It has frequently been assumed by archaeologists that stone adzes were a common tool in dugout construction. 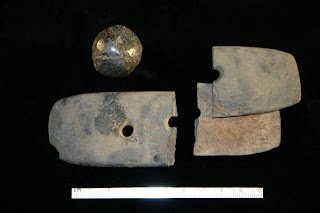 The stone adzes were made by grinding down basalt into the desired shape. This was time consuming but attaching them to handles was the real challenge. 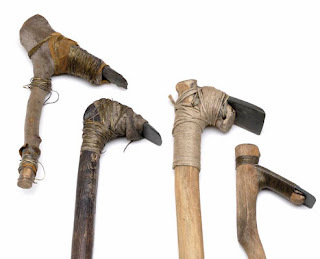 Several handles and one adze were broken but eventually we developed a design that worked very well. Once the dugout was completed, the wear patterns on the stone adzes were analyzed and compared to archaeological specimens. Surprisingly, the wear patterns on the experimental specimens were not the same as most of the archaeological specimens. Our conclusion was that adzes were not commonly used in dugout construction. For more information on dugouts, visit our Building a Dugout page.